We recently completed this new Phoenix landscape design client’s patio installation. 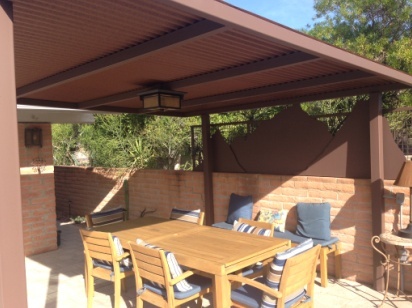 It features one of the latest innovations in shade structures – the corrugated steel roof. Painting them removes any relationship to barns or commercial buildings where this material has been used for decades. It just so happens that a rust color was perfect for this particular project. The steel framing makes the structure a sturdy, low maintenance outdoor living asset. Depending on the setting, this corrugated steel shade roof’s aura can take on a relaxed contemporary or modern rustic air. 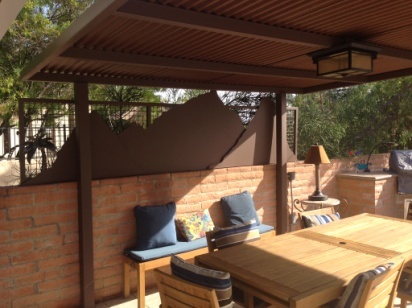 To increase the level of privacy they have on their patio, especially in the dining area, a steel sheet mountainscape was attached to the outside of the shade structure. An interesting approach to instant privacy screening at minimal cost. Traditional or modern – shade roofs by Desert Crest will definitely suit your sense of style.